 Adult western and first novel by the president and CEO of the PR firm Hill & Knowlton; film rights sold to Universal Pictures, with a screenplay by Larry McMurtry. All right, an adult western, but not a serious, epic adult western like McMurtry's Lonesome Dove. There's plenty of blood and daring in this tale, but no villain, since all action is morally grounded. Nat Swanson rides away from a west Texas town where he has killed a man in a fair fight. But the man's friends, believing him to have been shot in the back, set out to string up Swanson for murder. Pursued through Indian country in the parched New Mexico desert, Swanson comes across some wagons beset by Apaches. The wagons are manned by three nuns (a fourth is dead) who have rescued some children being held for ransom in Mexico. 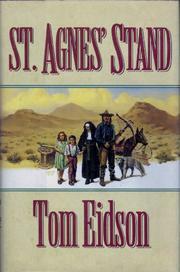 Swanson is tempted to go on, leaving the helpless folk to their deaths, but then joins their camp in a gully and helps the nuns hold off the Indians. The leader of the nuns is 67-year-old St. Agnes, who does not believe in killing Indians intent on killing her. Swanson finds himself in a moral bind, trying to save lives without killing anyone. Meanwhile, we join the Apaches and learn their motives for this attack. Although the Apaches have their own moral cat's cradle, they are nonetheless savages who enjoy torturing their victims. Will red magic, Apaches led by People of the Dream, prevail against black magic, the nuns praying in their shawls? Well, Eidson is not B. Traven, who would fearlessly lop our expectations off at the neck, but he does write clean and lean, with a hint of sage incense, and can strike a lingering chord. Should make mellow celluloid entertainment.